I recently heard about a website called beautyjoint.com from a fellow beauty blogger, where they sell NYX Cosmetics at a discounted price. I figured I would put in a small order just to try out the new matte lip creams. I received my lip products so fast, only 2 days after I had placed the order. I only bought 2 out of the 11 colors available, just in case I hated them. It's not lipstick, nor is it gloss. It's like nothing you've experienced before. It's lipstick cream that goes on silky but looks soft matte. These long-lasting lip creams come in 11 different colors that will be sure to keep your lips moisturized and colorful! Every time I try and wear a matte lipstick, my lips look super dry and dull with the color looking awful. 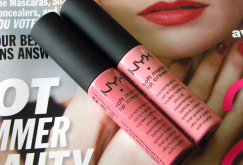 These matte lip creams are seriously amazing. They go on really smooth and they are even moisturizing. I know, it's hard to believe but it's true! Tokyo was a little bit too light for my skin tone, but I use a gloss over. Milan is the perfect pink for me, without looking too over the top. I can wear Milan any time of the day or night. I love it so much. They both lasted throughout the day with only one touch up. I am definitely going to buy more from Beautyjoint. Hope you found this review helpful in some way! both shades are really pretty! i def. need to try these out. I wish this website was available in the UK! These shades are stunning and I'd love to use them, your review makes them sound so excellent.